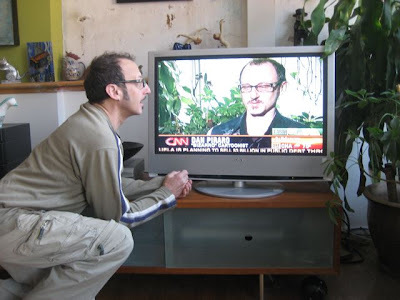 Here is a picture of me mesmerized by my own image, and a video clip of my interview, which I taped right off the TV with my digital camera. Most of my family missed the original airing of the show, so I'm hoping the CNN police will let me keep this on here for a while. For the record, I don't normally look as much like a serial killer nerd as I do in this clip. Sitting five feet from a bank of 1900 watt bulbs on stilts will do that to a guy. Nice work Mr. Piraro. So glad I found your blog. Again....how do you spell that..Peerero? other than that, very cool and you got the video to work! veeerrry nice. Thanks for posting that! I didn't know you'd be on, or I would've tried to see it live. 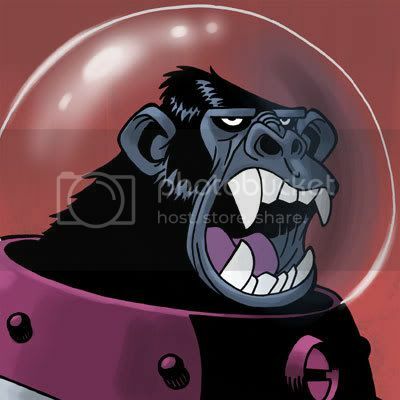 What program are you using there on your comic? Do you draw it directly on the computer now, or do you sketch it onto paper first and edit it later? As a cartoonist who would be happy with achieving even 1 iota of your success, please impart you wisdom onto me? It could be worse. There are web sites that call you “Dan Piraro”. DON. I meant to say Don. Glad you were able to bring even more attention than the norm and they used an awesome clip! I highly respect you and love your work. Keep rockin! I really don't think you look scary. At all. I was fortunate enough to turn CNN on just after reading your blog and caught the interview just in time. It was near the end of the hour but still early in the morning. I was really intrigued by the tool you were drawing with. I'm not up on electronic drawing pens, however it sure looks fun to use, probably expensive too. I'm glad they allowed you to speak. Any chance of a return visit with a segment where you draw Wolf Blitzer as a Werewolf attacking and devouring Lou Dobbs? Probably not a good idea, just a thought. 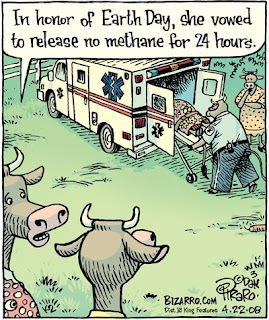 And a great cartoon about Cattle trying to hold in methane for a day. Can you imagine what the inside of that ambulance would smell like on the way to the animal hospital? Hey! Anybody got a match? well they used more than you lead on, but i'm sure it only seemed like a blink of time compared to the day's set-up and such. you like how it's just a part of the corporate beaurocracy to make being "green" a fad? although it's great that people are more willing these days to turn their behaviors around, it's not because they had a change of heart.. it's because it's the popular thing to do. i'm just sad that most people wouldn't change their habits but one day of the year because hallmark says so. that's all! keep being awesome. What is it with news people are pronoucing your name wrong anyway?